Transatlantic relations have seen brighter days. It’s no secret that there are several points of disagreement among the allied countries, even beyond security and defence topics. Recently, different stands on trade (the White House’s steel tariffs) and the US’s withdrawal from the Iran nuclear deal have dominated relations between NATO’s members. And so, for the first time in decades, the US and the rest of the alliance have significantly differing world views and interests. 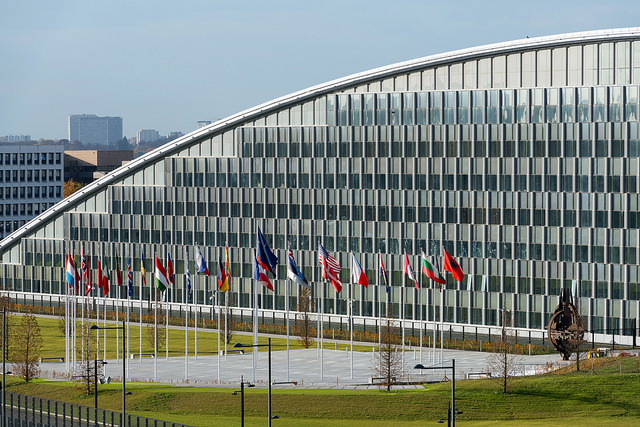 The next NATO summit is set to be held on 11–12 July. Tensions between the allied governments are high, and NATO watchers are asking themselves whether the meeting in Brussels will be marred by calamities similar to those at the G7 meeting in Canada. Uncertainty over whether President Donald Trump will stick to agreements or denounce them leaves his allies in limbo. So, what can we expect from the summit? Certainly, the Kremlin’s behaviour will be a hot topic. NATO Secretary General Jens Stoltenberg has stated that ‘dialogue with Russia is not easy. But the more difficult our relations are, the more we need dialogue’ . While the European members of the alliance are focusing on their eastern and southern borders, Washington insists  that burden-sharing needs to be on the top of the agenda in Brussels. Trump, like his predecessors, has harped on the discrepancy in defence spending among members of the alliance. The president attended a NATO meeting in May 2017, but Brussels will be the administration’s first official NATO summit. While Trump has backed down from his campaign description of NATO as ‘obsolete’, he continually reminds allies that the US expects more from them when it comes to defence spending. His failure to firmly endorse Article 5 of the NATO Treaty has increased worries about whether the US would come to the aid of its allies if need be. In June 2017, German Chancellor Angela Merkel called  for Europe to take more responsibility for its own defence and security and reduce its reliance on the US. European countries, mainly through the EU, have been boosting their defence capabilities, which will eventually make the European wing of NATO stronger. The permanent structured cooperation (PESCO) initiative was launched in 2017 (more here ), as was the European Defence Fund this year. Those and other steps were acknowledged  by US Secretary of Defense James Mattis, who regularly states his commitment to the alliance and common defence. NATO’s defence ministers met in June to make decisions in preparation for the summit. They agreed  to launch a new NATO readiness initiative—the ‘Four Thirties’. By 2020, 30 mechanised battalions, 30 air squadrons and 30 combat vessels will be ready within 30 days or less to counter possible aggression. The NATO command structure will be increased by 1,200 personnel, and two new commands  (in Norfolk, Virginia, and Ulm, Germany) will be established to support increasing capabilities. Credible deterrence requires that solutions to mobility obstacles be found in Brussels. At the moment, the rapid movement of arms across Europe, such as in case of Russian aggression against NATO members, is unthinkable due to border regulations and lack of infrastructure. Since Russia’s annexation of Crimea in 2014, defence spending by European NATO members and Canada has risen significantly (up by a total of US$45.8 billion ). While only a few have reached the goal of spending 2% of GDP on defence, the situation is improving. Germany had a real increase of 6% in 2017; the biggest increases were recorded  in Bulgaria, Romania, Latvia and Lithuania, all of which are Bucharest 9 (B9) members. The B9 is a regional group within NATO consisting of countries that joined in the late 1990s and early 2000s, all of them in Central or Eastern Europe. Those countries have historically seen Russia as more threatening than have alliance members in Western Europe. During a recent meeting in Poland, they agreed to push for more NATO capabilities in the region. Similarly, they had agreed to make their combined voice heard before the 2016 summit in Warsaw, which eventually saw the region being given significant alliance commitments. At that time, it was agreed to deploy rotating multinational battalions in the three Baltic states and Poland, along with a mobile US brigade in Poland. But Poland now wants more  and has offered to pay US$2 billion a year for a permanent US presence. Many other NATO members view this push critically, arguing that it would provoke the Kremlin unnecessarily (permanent stationing would violate the NATO–Russia Founding Act). Within Poland, some contend that the money would be better spent on maintaining and modernising the Polish forces. Another topic on the agenda will be a possible further expansion of NATO membership. After Macedonia and Greece settled their long name dispute, the way has been cleared for what’s now North Macedonia to join both NATO and the EU. The B9 meeting’s communiqué  also touched on this: the door to future cooperation with NATO hasn’t been shut yet for Georgia, Moldova, Ukraine and the western Balkans. However, it’s unlikely that Georgia and Ukraine will join anytime soon, even if they are crucial to European security. With Georgian territories occupied by Russia, an active conflict on Ukrainian territory and the illegal annexation of Crimea, NATO won’t be keen to expand in that direction. Stoltenberg has said that the differing opinions among NATO allies won’t affect  their commitment to collective action. But it may not be so easy. The Europeans don’t want to rely on good faith and will push for more individual initiatives. The Washington Post  recently revealed that, during a meeting with Swedish Prime Minister Stefan Löfven, Trump suggested that the US might consider the Swedish partnership model with NATO rather than being a member. That in itself speaks volumes. Furthermore, Trump is planning to leave his transatlantic allies in Brussels to meet with Russian President Vladimir Putin in Helsinki  on 16 July. How far the White House is prepared to go is yet to be seen, but Trump’s easily made concessions to Kim Jong-un, paired with his alleged statement  that Crimea is Russian because people there speak Russian, will have made Washington’s allies uneasy. Transatlantic relations may continue to be strained for some time yet. Jacqueline Westermann is a researcher at ASPI. Image courtesy of Flickr user NATO.